I’m really fortunate to see my father more often than would otherwise be, since work brings him to where I live quite often. And since he loves fruits, I love to make fruit desserts for him. 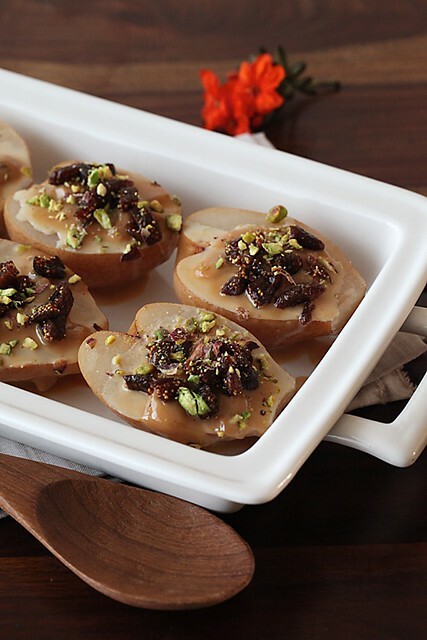 I poached these pears with some of my favourite spices when my parents were visiting us this week. I made lots of vegetables employing various methods of cooking, stir frying, grilling and baking them up and this was the perfect pairing with all those vegetables. My parents actually grow pink pepper and using this here was a perfect tribute to their produce. Pink pepper has such a delicate flavour and such a lovely colour. It looks so appealing and pretty and milder in comparison to black and white pepper, has a special sweet character of its own. It is no secret that I love cinnamon and vanilla. I used them whole here allowing their flavours to seep into the pears. 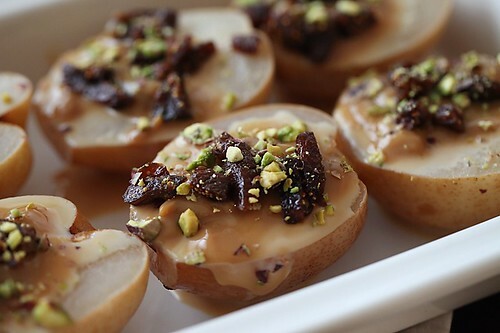 The poached pears are topped with one of my favourites Dulce De Leche. There are various ways to make homemade Dulce De Leche, some are tedious and laborious and some are not. The easiest and the best way to make it at home is with a pressure cooker. A pressure cooker is an indispensable part of almost any kitchen here in India. It saves time and energy and preserves nutrients. And if the basic instructions are followed and if it is not left unattended, it is quite safe to use. Dulce de Leche is so smooth & creamy and so delectable. All you need to make it at home is a can of sweetened condensed milk and a pressure cooker. 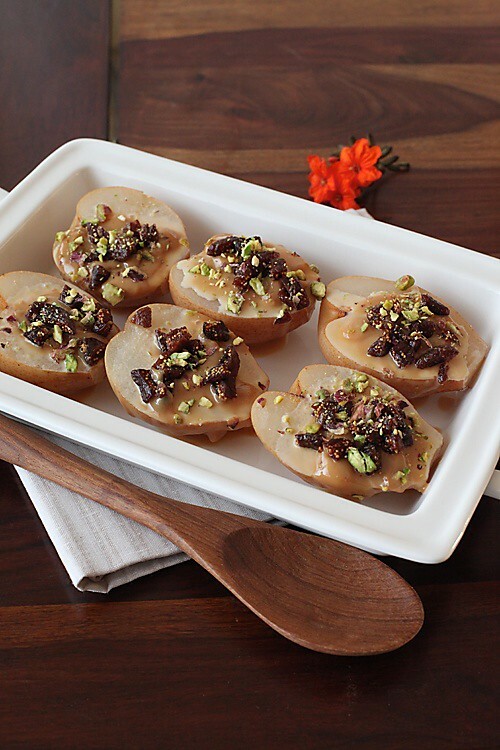 Drizzled over poached pears, it oozes out all its caramel goodness. You can make so many wonderful preparations with this or eat it straight out of the can. Either way, it won’t disappoint! 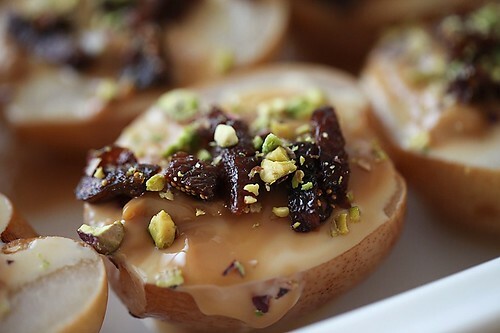 The chopped dried figs and the crushed pistachios sprinkled over dulce de leche add crunch and colour making this visually appealing and providing the palate different textures in a single bite. 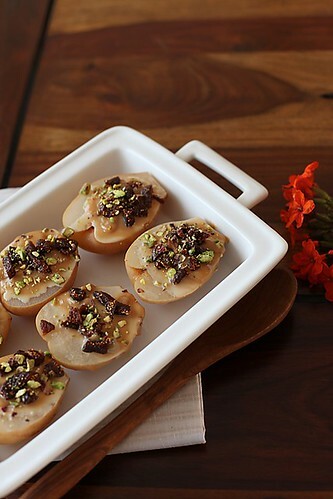 The softness of the poached pears, the smoothness of dulce de leche, the chewiness of the dried figs and the crunch of pistachios, all come together in a delightful spoon. 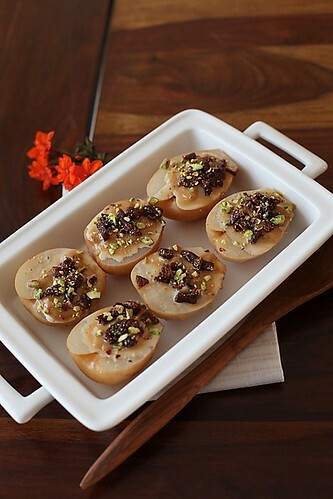 I bet you can’t go wrong with this one and you are sure to stun your family and friends with this beautiful and elegant dessert. 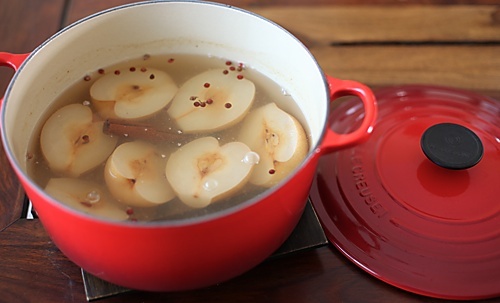 In a large stockpot or a cocotte, place the halved pears and all the other ingredients. 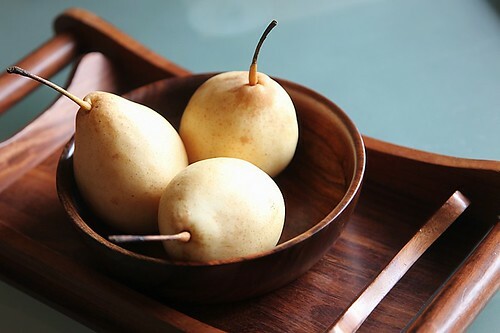 Pour enough water over the pears and cook for about 15 to 20 minutes or until a knife runs through the pears. Place the condensed milk in a pressure cooker with water running half way through it. Close the lid with the pressure valve and put it to cook on medium heat. After the first whistle, lower the flame and cook for 30 minutes for a light caramel coloured dulce de leche and for 40 to 45 minutes for a deeper coloured and thicker dulce de leche. I prefer cooking it for 30 minutes as I like the sauce to be runny. Carefully remove the pears and place them over a plate lined with tissue paper to absorb the water. Once drained, place the pears in a serving plate and spoon some dulce de leche over the pears. 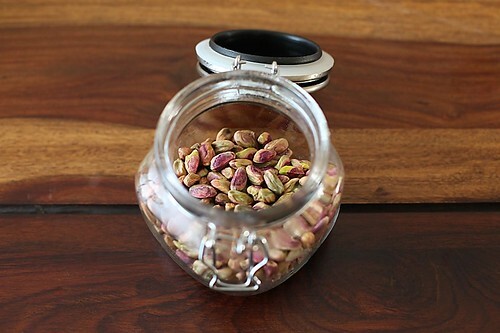 Sprinkle the chopped figs and crushed pistachios over the dulce de leche. Serve at room temperature or chilled. Pink pepper! That sounds absolutely gorgeous! Thats so cute, pink peppercorns as a tribute! pretty pretyy pics and fantastic flavors! The pictures in this post are smashingly amazing! And the recipe itself, sounds healthy and delight to make. Actually, this would be good for ppl who dont like fruits in their original form, or think fruits are tedious to eat. This is an enticing way to make for such folks. Yes folks the flavours are incredible here. Simi: You are right. Cooked fruits are enjoyed by those who are not particularly fond of fruits. And the name came out just right! I remember u trying to phrase it and re-phrase it. Its just the best, anu akka! You did it again…another perfectly presented dessert. Fabulous!!! Dessert can't get any better than this. I love the ingredients and the dulce de leche topping. Fabulous! Gorgeous pictures from such simple ingredients! Can you pl. tell how to keep the condensed milk in the cooker- in a cooker vessel? covered or uncovered? won't water get inside? For Dulce de Leche, the can has to be opened or a sealed one has to be put in the pressure cooker? Didnt know it could be that easy! Seethalakshmi: You put the entire tin inside the cooker so there is no chance of water seeping in. The can is opened after it is cooked after cooling down. Madura: Hi…You can use 3 to 5 litres I guess…any medium size would do. Ritu: You put in an entire can of unopened condensed milk inside the cooker for cooking. You open the tin/can after it cooks and cools down. Ann: Yes you are right. I have tried that method too but it is quite time consuming and needs to be watched over. I find the pressure cooker method a real time saver.